Fort Worth's Fourth is back and bigger than ever! Be sure to click on last year's video above and see this great, family event. You don't want to miss this free 4th of July celebration on the banks of the Trinity River at Panther Island Pavilion just behind Downtown Fort Worth. Admission and all family activities are free to the public. The celebration starts as 2 p.m. with family activities, live music and jet ski shows. When the sun goes down, a spectacular fireworks show will start at 10 p.m.
A new activity for Friday's celebration will be fly board shows. These awe-inspiring, adrenaline pumping shows feature riders performing tricks on what can only be described as water fueled jet-packs. These highflying daredevils are guaranteed to make your heart stop with stunts only seen in the movies. 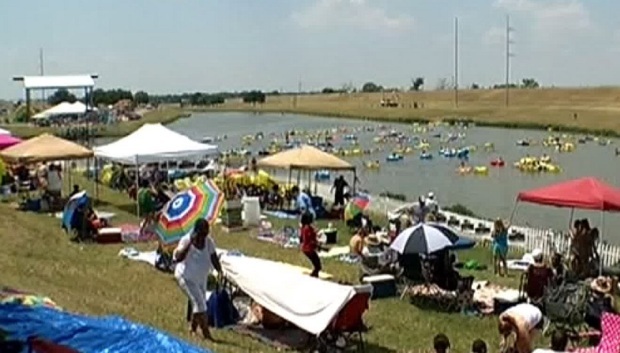 Jet ski shows will also be back at Fort Worth's Fourth. The shows feature pro watercross tour's Daniel Martin and his team. Martin is known for wowing the crowd with tricks such as double back flips, helicopters, reverse rinse repeat and more. Free activities will include tubing, pony rides, miniature golf, levee slide, train rides, bounce houses, water slide, treasure dig, face painting and much more! There will be live music from Larry g (EE) who has performed on Jimmy Kimmel and the high-energy cover band Party Machine. A new addition to the festival this year is the option to upgrade to VIP tents. These five tents will be scattered across the festival grounds and will offer shade, seating, access to a cash bar which will serve Deep Eddy Vodka and VIP bathrooms. VIP ticket-holders will also have access to the 92.1 Hank FM "Party on the Hill" which will feature live music from some of you favorite local country artists. Gates open at 2 p.m., live music will be from 6 p.m. to 9:30 p.m. and fireworks will begin at approximately 10 p.m. Preferred parking is $10 and overflow parking is $5. At 8:30 p.m., the Fort Worth police will begin setting up outbound traffic plan for all events. The closer it is to 8:30 p.m., the heavier the traffic will be. Visitors should arrive early to avoid traffic delays. Traffic flow maps can be found at www.fortworthpd.com. Crews are working on preparations for one of the biggest 4th of July celebrations in North Texas - Fort Worth Fourth at Panther Pavilion. For the west side of downtown, Henderson Street will be closed at White Settlement Road. From 2:30 p.m. to midnight, the right northbound lane will be dedicated as an emergency lane only. Drivers caught using the emergency lane may be issued a ticket. For the safety of patrons, no outside coolers will be allowed on the festival grounds. Cash and all major credit cards can be used to purchase food, soda beer and water on site. Fort Worth Fourth organizers are ready for large crowds this year with new parking routes for the more than 100,000 expected attendees. 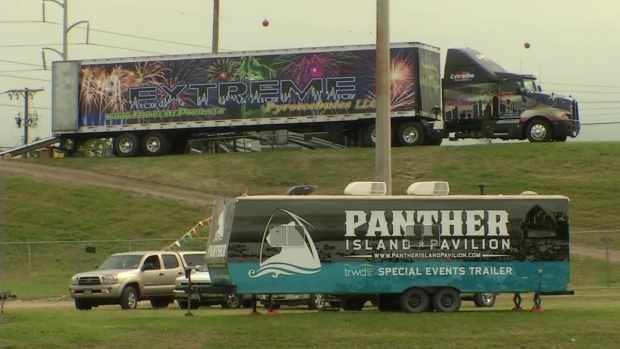 Crews are already setting up for the Fort Worth Fourth at Panther Island Pavilion.